Read for This Week’s Study: John 11:48-50, 1 John 2:15-17, 1 Cor. 9:19-27, John 3:3-8, 1 Cor. 16:19. Memory Text: “Though I am free and belong to no man, I make myself a slave to everyone, to win as many as possible” (1 Corinthians 9:19, NIV). Key Thought: A short study of the context of ancient Thessalonica demonstrates that Paul’s approach to the citizens of Thessalonica was unique and carefully crafted. This material is important for two reasons. First, it helps us to understand how Paul’s original hearers and readers would have understood him. In so doing, it clarifies the meaning of what he wrote and the impact it had back then on both church and society. Second, the more we know about the ideas and beliefs of the Thessalonians, the better we can understand that against which Paul was reacting. In order to promote the gospel, Paul would also have to correct wrong ideas. So, while this lesson is not directly focused on the Bible, it sets the stage for our reading of the biblical text of 1 and 2 Thessalonians during the rest of this quarter’s lessons. *Study this week’s lesson to prepare for Sabbath, July 21. Read John 11:48-50. How were the political and religious decisions regarding the ministry of Jesus impacted by the arrival of the Romans in first-century Palestine and Jerusalem? Think through the logic expressed here. In what frightening ways does it make sense? In the context of a civil war among the Greek city-states, the Thessalonians invited the Romans to take over their city and protect it from local enemies around 168 b.c. The Romans rewarded Thessalonica for being on the “right side” of the civil war by largely allowing the city to govern itself. It became a free city within the empire, which meant that it could largely control its own internal issues and destiny. As a result, the wealthier and more powerful classes in the city were allowed to continue life much as they had before. They were, therefore, pro-Rome and pro-emperor in Paul’s day. But life was not nearly so pleasant for the common people, especially the working classes. There were three major negative aspects to Roman rule in Thessalonica. First, the arrival of the Romans brought economic dislocation. The usual markets were disrupted by war and changing governments, both locally and regionally. These disruptions hit the poorer classes harder than they did the more wealthy. Over time, this negative aspect became less significant. Second, although Thessalonica remained largely self-governing, there was still a sense of political powerlessness. Some local leaders were replaced by strangers whose loyalties were to a city far away (Rome), rather than to Thessalonica. No matter how benign, foreign occupation is not popular for long. Third, there was the inevitable colonial exploitation that accompanies occupation. The Romans required a certain amount of tax exportation. Percentages of crops, minerals, and other local products would be siphoned off and sent to Rome to support the larger needs of the empire. So, while Thessalonica was quite a bit better off than Jerusalem, for example, Roman rule and occupation inevitably created significant stresses in local communities. In Thessalonica, those stresses were particularly hard on the poor and the working classes. As decades passed, these Thessalonians became increasingly frustrated and longed for a change in the situation. How does the current political situation in your community affect the work of the church? What kinds of things can, or should, your church do to improve its place and standing in the larger community? The pagan response to the powerlessness many Thessalonians felt was a spiritual movement scholars call the Cabirus cult. The cult was grounded in a man named Cabirus who spoke up for the disenfranchised and was eventually murdered by his two brothers. He was buried along with symbols of royalty, and the cult came to treat him as a martyred hero. The lower classes believed that Cabirus had exhibited miraculous powers while alive. They also believed that from time to time Cabirus quietly returned to life in order to help individuals, and that he would return to bring justice to the lower classes and restore the city to its past independence and greatness. The Cabirus cult provided hope for the oppressed in terms reminiscent of the biblical hope. Things get even more interesting when we discover that the worship of Cabirus included blood sacrifices to commemorate his martyrdom. Reminiscent of Paul, the Thessalonians spoke of “participation in his blood.” By this means they obtained relief from guilt; class distinctions were also abolished. In the Cabirus cult all classes of society were treated equally. But there was one further dynamic. When the emperor cult arose in the time of Augustus, the Romans proclaimed that Cabirus had already come in the person of Caesar. In other words, the occupying authority co-opted the hope of the oppressed. As a result, the spiritual life of Thessalonica no longer provided relief for the working classes. The common people were left without a meaningful religion. The existence of the emperor cult also meant that if anyone resembling the real Cabirus were to arrive in the city, he would be an immediate threat to the establishment. The Roman response to the Cabirus cult left a spiritual vacuum in the hearts of the people-a vacuum that the gospel alone could fill. Christ was the true fulfillment of the hopes and dreams that the Thessalonians had placed on Cabirus. The gospel provided both inner peace in the present and, at the Second Coming, the ultimate reversal of current economic and political realities. Read 1 John 2:15-17 (see also Eccles. 2:1-11). What crucial truths are being expressed here? How have you experienced the reality of these words, in regard to how fleeting and ultimately unsatisfying the things of this world are? Given what we learned yesterday, it is not difficult to see why-when the gospel came to Thessalonica-many non-Jews of the city responded positively. Whether or not Paul was aware of the Cabirus cult before arriving in the city, his Messianic approach in the synagogue resonated with the unique spiritual longings of the local pagans. When the gospel came to Thessalonica, the working classes of the city were ready for it, and they responded in large numbers. They were also ready for extreme interpretations of the gospel. The Cabirus cult had enshrined in the people a spirit of rebellion against authority that may have been the source of the disorderly conduct that Paul addresses in his two letters to them (see 1 Thess. 4:11, 12; 5:14; 2 Thess. 3:6, 7, 11). Read 1 Corinthians 9:19-27. What fundamental missionary strategy does Paul lay out in this passage? What potential danger lurks in this method? How can the two principles of this passage be kept in proper balance? The gospel has the greatest impact when it impacts the needs, hopes, and dreams of the audience. But while the Holy Spirit can provide bridges for the gospel, this normally happens as a result of much listening and prayerful experimentation on the part of those witnessing. Experience has also taught us that people are most open to the Adventist message in times of change. Among the changes that open people to new ideas are economic turmoil, political strife, war, weddings, divorce, dislocation (moving from one place to another), health challenges, and death. The Thessalonians had experienced their fair share of change and dislocation, and this helped the gospel to take root. But people who are baptized in times of dislocation also tend to be unstable, at least at first. Most apostasies occur in the first few months after conversion. The letters to Thessalonica bear witness to considerable instability in the church in the months following Paul’s original visit. What can we do to help members who are still adjusting to their new life in Christ? Seek out someone new, or even a young person. What can you do to help keep this person grounded and stable in the Lord? You’ll be amazed to find out how much this kind of ministry will help strengthen yourself, as well. The first-century Greco-Roman context experienced a proliferation of popular philosophers who, in public forums, sought to influence individuals and groups-similar to what street preachers might do today. These philosophers believed that people had an inner capacity to change their lives (a form of conversion). Philosophers would use public speech and private conversation in order, they hoped, to produce change in their students. They sought to create in their listeners doubts regarding their current ideas and practices. By this means, the listeners would become open to new ideas and change. The ultimate goal increased self-reliance and moral growth. It was expected that such popular philosophers would earn the right to speak by first gaining moral freedom in their own inner lives. “Physician, heal thyself” was a well-known concept in the ancient world. These philosophers were also aware of the need to vary the message in order to meet various minds, and of the importance of retaining integrity in both the character of the teacher and the message that was being taught. Thus, there are numerous parallels between these popular teachers and the work of Paul, who also traveled around and worked in the public places (Acts 17:17; 19:9, 10). There were, however, two significant differences between Paul’s approach and that of these popular philosophers. First, Paul not only worked in the public places; he also sought to form a lasting community. This requires some separation from “the world,” along with the formation of emotional bonds and a deep commitment to the group. Second, Paul taught that conversion was not an inner decision, effected by wise speech; it was, instead, a supernatural work of God from outside a person (see Gal. 4:19, John 3:3-8; Phil. 1:6). Paul’s teaching was more than just a philosophy; it was a proclamation of the truth and a revelation of the powerful work of God in the salvation of humanity. The dark side of the popular philosophers was that they found an easy way to make a living. Plenty were hucksters, nothing more. Some would sexually exploit their listeners. Though honest teachers were among them, a lot of cynicism regarding traveling speakers existed in the ancient world. Paul sought to avoid some of that cynicism by generally refusing support from his listeners and, instead, doing hard manual labor to support himself. This, along with his sufferings, demonstrated that he truly believed what he preached and that he was not doing it for personal gain. In many ways, Paul’s life was the most powerful sermon he could preach. Read Romans 16:5; 1 Corinthians 16:19; Colossians 4:15; and Philemon 1, 2. What do all these texts have in common? In the Roman world there were two main types of residences. There was the domus, a large, single-family home built around a courtyard, typical of the wealthy. Such a home could provide a meeting place for 30-100 people. The other type of residence was the insula, with shops and workplaces on the ground floor facing the street and apartments (flats) on the floors above. This was the primary urban housing of the working classes. One of these apartments or workplaces could normally accommodate only smaller churches. The domus, and many of the insula, would house an extended family-including two or three generations, employees of the family business, visitors, and even slaves. If the head of household could be converted, it could have a great impact on everyone else living there. The ideal location for an urban house church would be near the city center. The shops and workplaces connected to the house would foster contact with artisans, trades-people, shoppers, and manual laborers looking for work. This was the setting in which much of Paul’s missionary work may have been done. In some parts of the world, people still worship in home churches, often because that’s all they have. Or, in some cases, they are not allowed to do anything else, and so a home church is their only option. Read Acts 18:1-3. How do these verses help us to understand how Paul worked? As a Roman citizen and, at one point, a member of the Jewish elite, Paul must have been from the upper classes. If so, working with his hands would have been a sacrifice for him; however, by way of such labor, he identified with the working classes and reached out to them (see 1 Cor. 9:19-23). How well does your local church interact with the community? Are you part of that community, in the sense of being involved, or is your church locked in “a siege mentality” in which you isolate yourself from the dangers of the world so much so that you don’t impact it at all? Further Study: “Providence had directed the movements of nations, and the tide of human impulse and influence, until the world was ripe for the coming of the Deliverer. . . .
“At this time the systems of heathenism were losing their hold upon the people. Men were weary of pageant and fable. They longed for a religion that could satisfy the heart.”-Ellen G. White, The Desire of Ages, p. 32. “Outside of the Jewish nation there were men who foretold the appearance of a divine instructor. These men were seeking for truth, and to them the Spirit of Inspiration was imparted. One after another, like stars in the darkened heavens, such teachers had arisen. Their words of prophecy had kindled hope in the hearts of thousands of the Gentile world.”-Page 33. “When Paul first visited Corinth, he found himself among a people who were suspicious of the motives of strangers. The Greeks on the seacoast were keen traders. So long had they trained themselves in sharp business practices, that they had come to believe that gain was godliness, and that to make money, whether by fair means or foul, was commendable. Paul was acquainted with their characteristics, and he would give them no occasion for saying that he preached the gospel in order to enrich himself. . . . He would seek to remove all occasion for misrepresentation, that the force of his message might not be lost.”-Ellen G. White, Gospel Workers, pp. 234, 235. In what contexts would a private home or apartment be an effective location for a church in today’s world? Are designated church buildings always the best way to do church? Why, or why not? How can your church learn to better adapt its outreach to the local community? That is, why must we always remember that what might work in one area might not in another? Summary: The biblical accounts of Paul’s missionary activity are set in the context of ancient Rome. As we see Paul wrestling with everyday issues, we can learn how to better apply the principles and lessons that God placed in Scripture for us today. In 1 and 2 Thessalonians, Paul was guiding ancient urban Christians through challenging times. Most Adventist churches in Haiti hold evangelistic meetings in January. Etienne’s host family invited her to attend the meetings in their church. Etienne went to please her hosts, but she paid little attention to the speaker. Etienne learned that the Morija Adventist Church hadn’t been destroyed, and she made her way to the church. The members welcomed her onto the church grounds and showed her a space where she could sleep outside with other now-homeless people. She had no tent and no bed, so she flattened a cardboard box to make a bed. Someone offered her some rice and greens, but Etienne shook her head. She had no money to pay for it. “You don’t have to pay,” the woman told her. “Take it and eat.” Gratefully Etienne took the plate, stunned to think that someone would give her food. 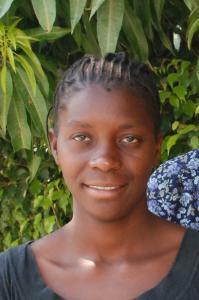 Etienne attended the baptismal class every afternoon and accepted the truths she was learning. A few weeks later she was baptized. “Life is difficult,” she says quietly. “I don’t know what my future holds, but I know that God will take care of me. He’s already shown me that. Haiti has more than 350,000 Adventist believers. Our mission offerings and a recent Thirteenth Sabbath Offering are helping the faithful believers spread the gospel of hope to the 9.7 million Haitians. Etienne, 22, lives in a tent in Port-au-Prince, Haiti.